as I'm flying to New Zealand later today for a couple of weeks holiday. Well, I say holiday but in fact we have a very tight schedule of wedding matters to deal with, friends and family to visit and then finally a wedding in Christchurch to attend. Luckily we have 4 days in Marlborough to taste some wines and it looks as if I will be able to meet the Kapiti Fusiliers at some stage and some other wargaming chums. So the blog will be quiet for a couple of weeks, and I have kept a couple of things back so there will be some posts when I return in mid-July. 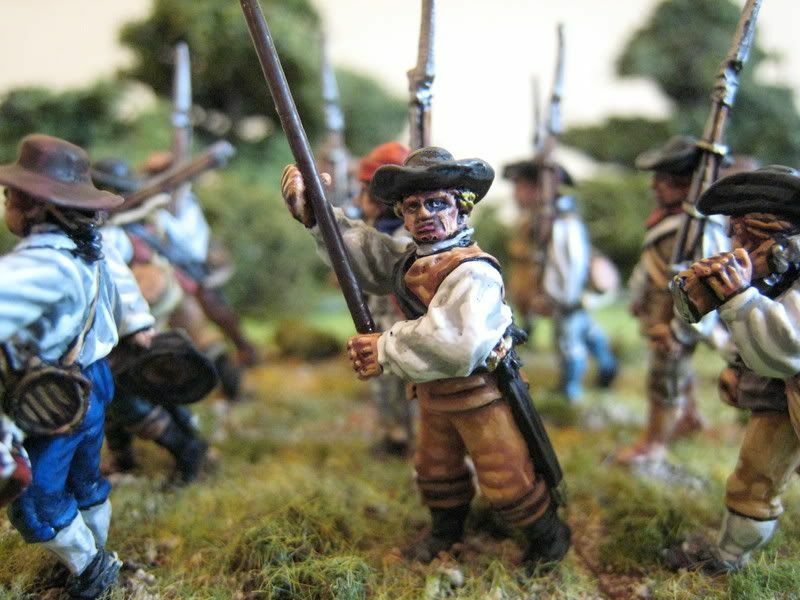 My intention when I started work on the new Perry southern militia releases was to paint up one 20-figure unit for each state of Virginia, South Carolina and North Carolina. This is the last of the trio, the Baden and Brunswick counties militia from North Carolina. 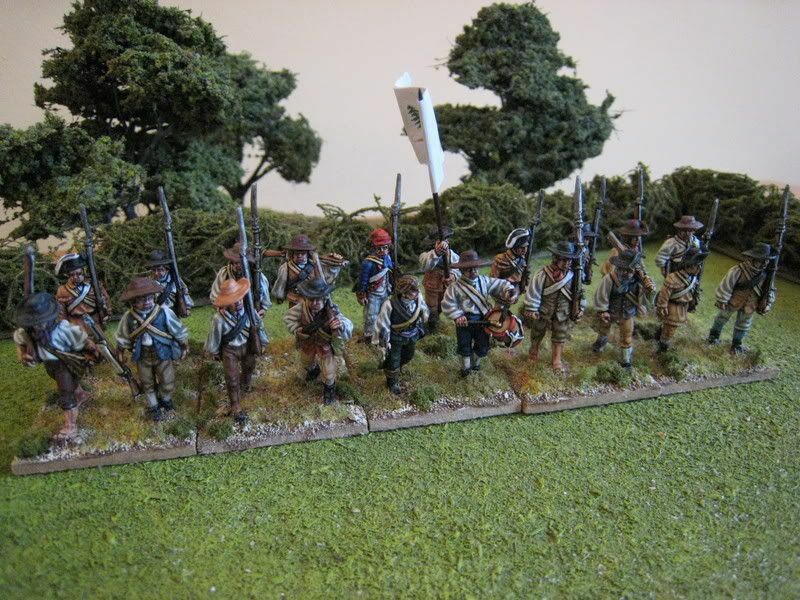 The core of the unit comprises the two current Perry marching southern militia packs and I have added a couple of regular army veterans in regimental coats and hunting shirts. I'm not entirely sure at present how to use the pack of chaps in (shortened) regimental coats and funny hats - you could make a "campaign dress" Continental regiment out of them I suppose; there are a couple of plates in Mollo showing early war Continentals in shortened coats, so maybe this is something I will turn to later in the year. The flag is from "Flags for the Lads" and is described as being the flag of the militia from the two counties mentioned earlier. 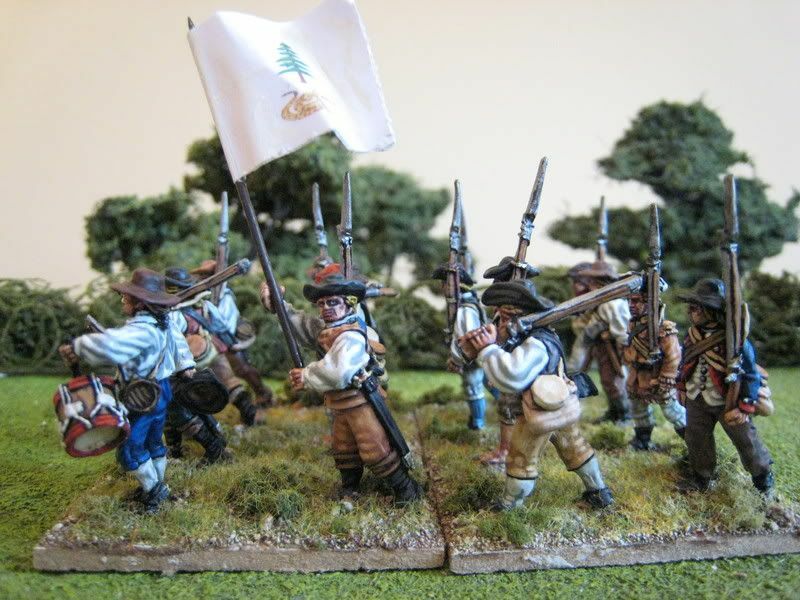 The liberty tree and rattlesnake motif is fairly standard, so these chaps could pass for anything really. For some reason Flags for the Lads flags have black lines through the centre, so I painted these out and touched up the flag generally to add more shading and highlights to it. I quite like the way this unit turned out - the drummer is clearly concerned about the trajectory of incoming cannonballs. 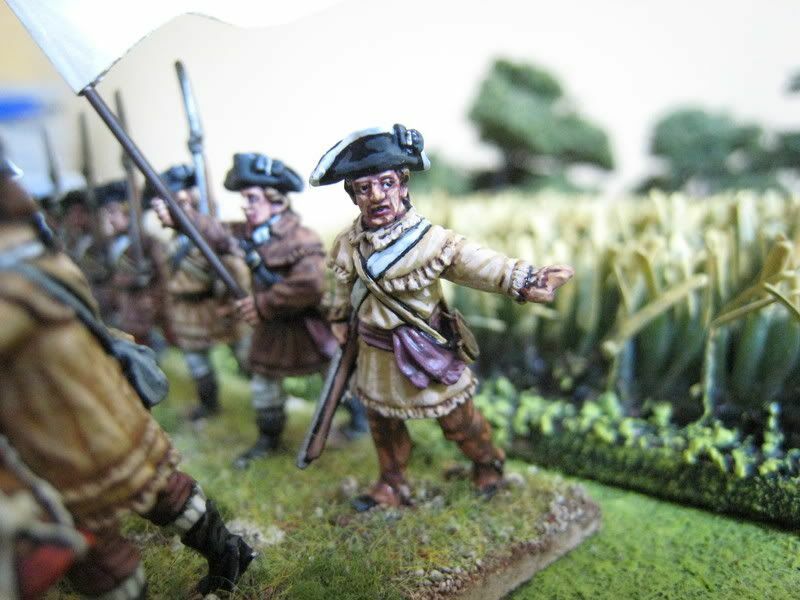 Incidentally, I received the July "Wargames Illustrated" yesterday and the Perry Miniatures advert includes two more packs of Southern militia - another firing line pack and a "nervous firing line" - pics of figures from the latter suggest that this pack is essentially militiamen running away! Alan Perry is really spoiling us now...The hedges in the background are by Barry Scarlett. 20 figures. Painted May/June 2008. Flag from "Flags for the Lads". Sorry for the lack of activity on this blog of late; there will be pics of my latest units by the end of the week. Working on 2-3 units at the same time has its advantages, but it has resulted in a delay in posts. However, the next two are now finished, with just the final touches to add to their bases. 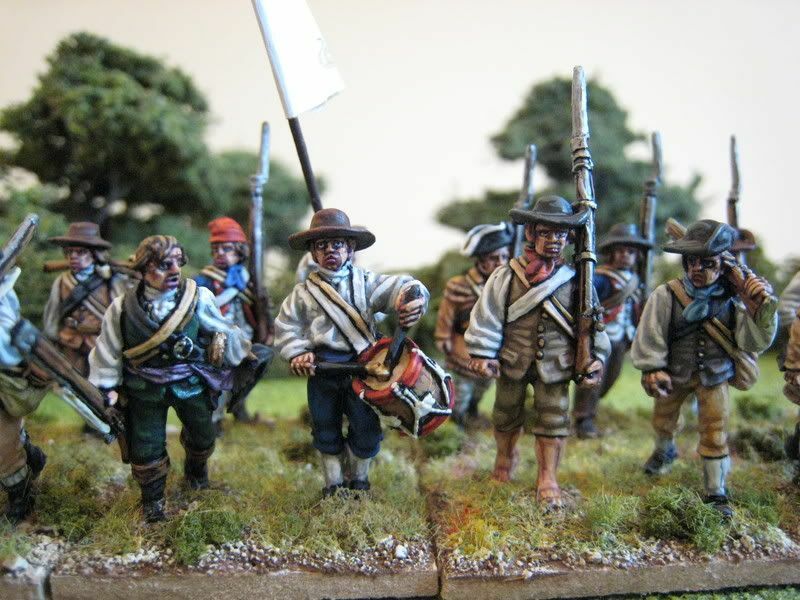 I am also trying to finish another unit, the last of my 6 militia/Continental regiments, before the middle of next week, which is when I fly out to New Zealand for a short while. This regiment is modelled closely on the Don Troiani painting of Washington in the Philadelphia campaign (see here). In the meantime, I thought it might be worth drawing readers' attention to a couple of things. First, I was sad to read of Paul Darnell's decision to hang up his hobby boots for a while. Paul makes absolutely first class stuff (his corn-fields often appear in pics for this blog) and the Touching History games at London shows over the past couple of years have been personal favourites of mine. Bt now many readers will know that the latest issue of Paul's Touching History model-making books covers the AWI, the F&IW and the ACW. A few months ago I drove up to Paul's former abode near Chelmsford with a substantial chunk of my AWI collection so that Paul could take some photos for this book. Given that the photos I take for this blog are taken quickly and with very little thought to their composition, I was impressed with how much effort Paul put into each shot - checking the light was just right, trying out slightly different angles etc. 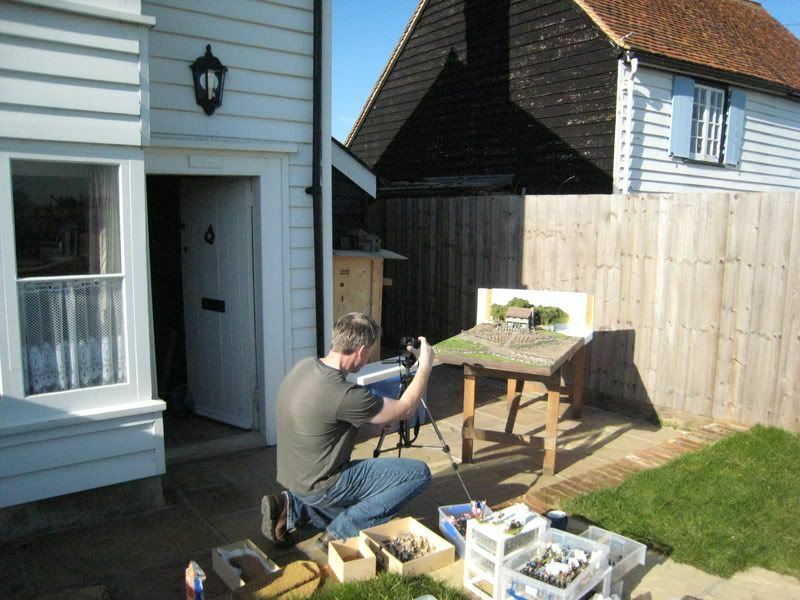 The results were excellent and the book generally is highly recommended; not just for the photos of the figures but also for the modelling and terrain-building tips. Given Paul's change of focus away from wargaming, his books are available for a short time now, although I suspect other stockists will still have a few copies at shows. Above is a photo of Paul taking a photo of my figures. Secondly, an AWI mega-game has been arranged for the first weekend of November at a venue in South Timms, just outside London. Using "British Grenadier!" 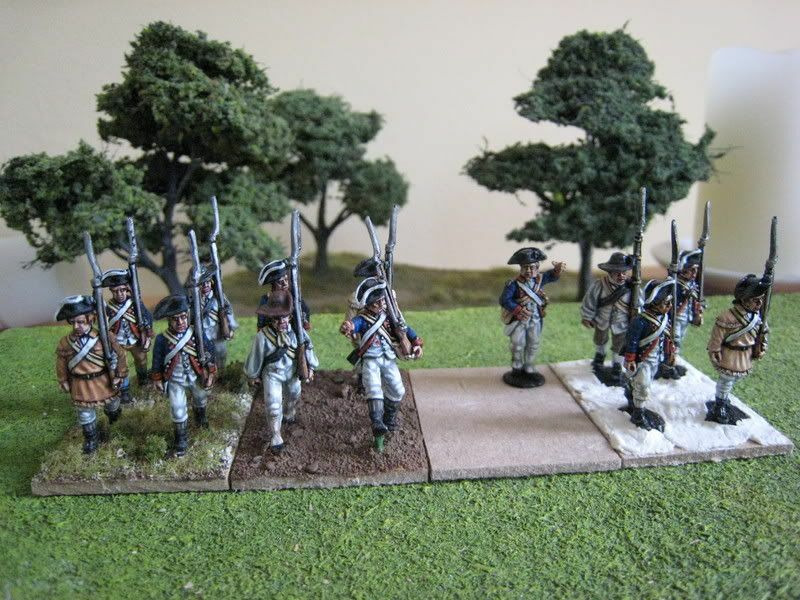 rules (of course), we will be having a go at Long Island, with a scenario specially developed by those experts in all things 18th century, Eclaireur and Ronan the Librarian. 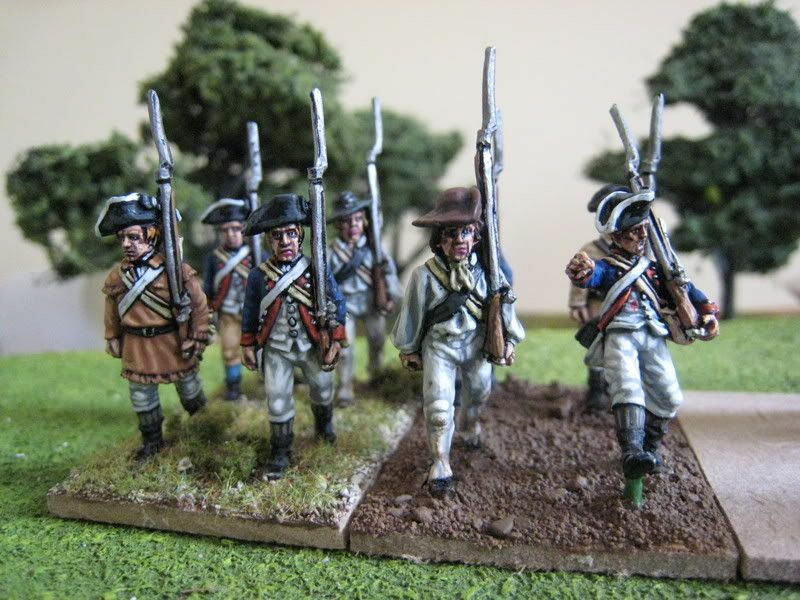 I am hoping that my new militia/scruffy Continental units will see some action, and there may perhaps be a need to paint up some specific regiments. 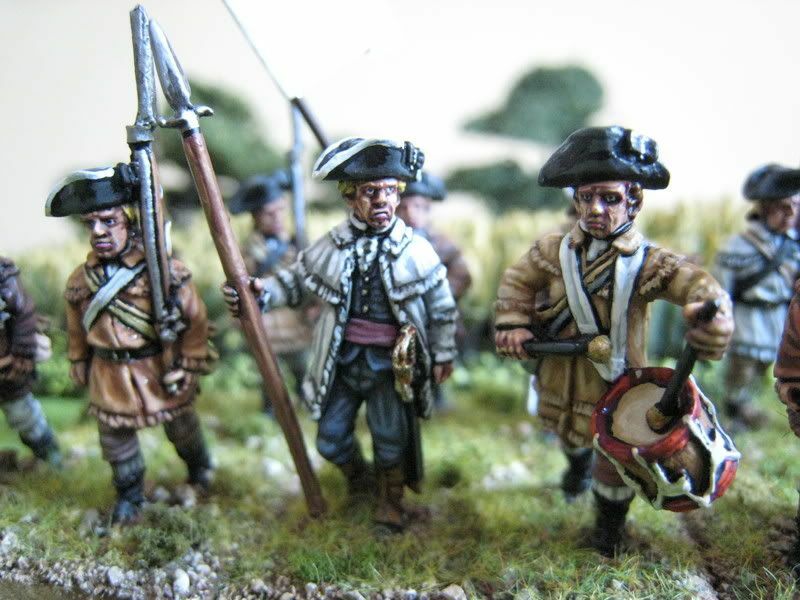 Something I have already discussed with Ronan is how we might be able to ensure that the "look" of the British and American regiments is correct; I suspect we will be seeing more 1768 Warrant uniforms on the table than we did when re-fighting Brandywine and Monmouth a few years back. Between now and November I will be posting further details about the preparation for this game. 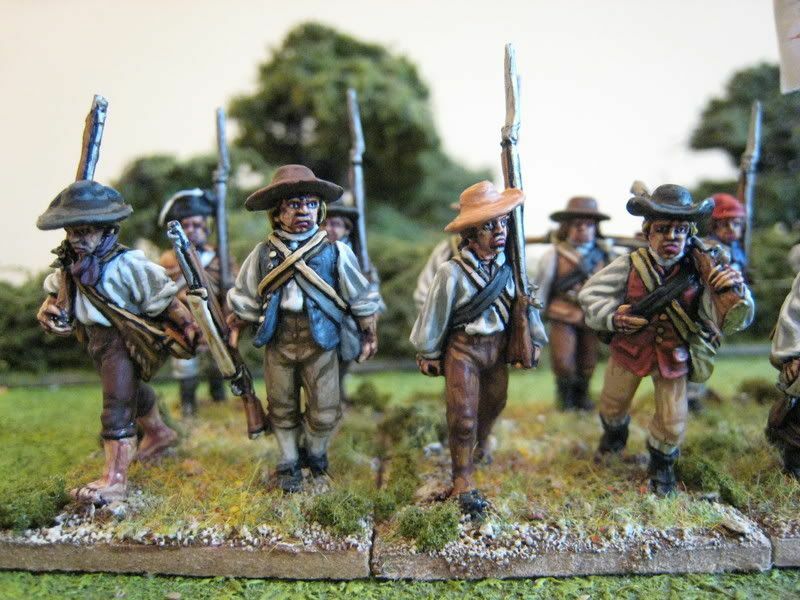 Thirdly, it came to my attention today that Perry Miniatures will be releasing black militiamen at the end of July (you can see the greens on the Perry website). 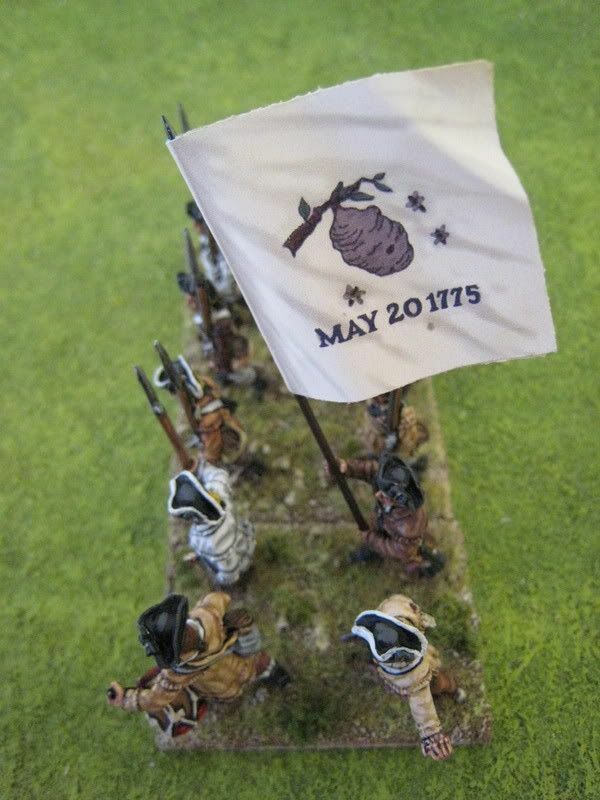 Joyous news and a very welcome addition to the range - no more need to scour Foundry's pirates range! This will probably require a slight re-jig of the units I have been painting recently once the new figures are available. 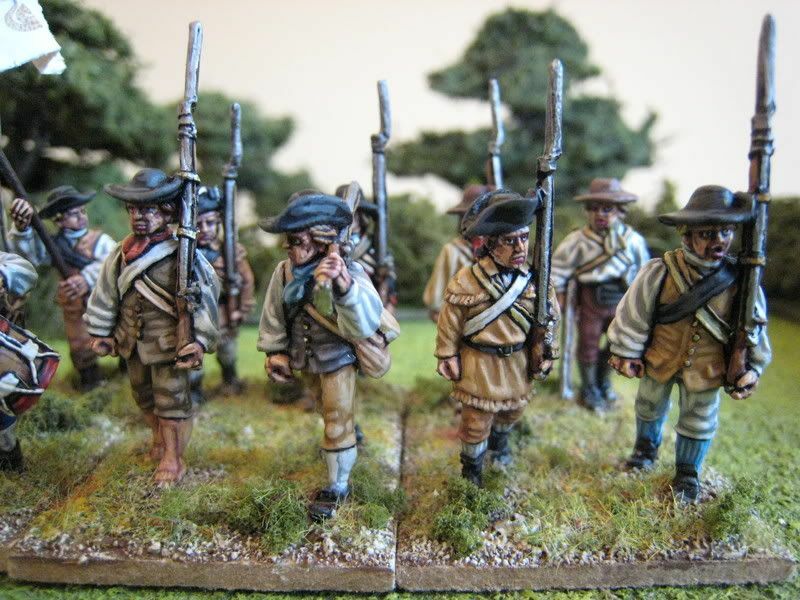 I have been delayed from posting about this latest regiment as all through last week I kept changing my mind about how I wanted to arrange the various figures I have been working on and all those "Southern militia" types I bought at Salute. A large part of my deliberations centred on how authentic it really is to have different coloured hunting shirts in the same "regular" units (as opposed to militia). There are recorded instances of regiments dyeing hunting shirts a particular colour and as the shirts formed part of the kit that was issued to soldiers one might expect each issue to consist of shirts of broadly the same colour. 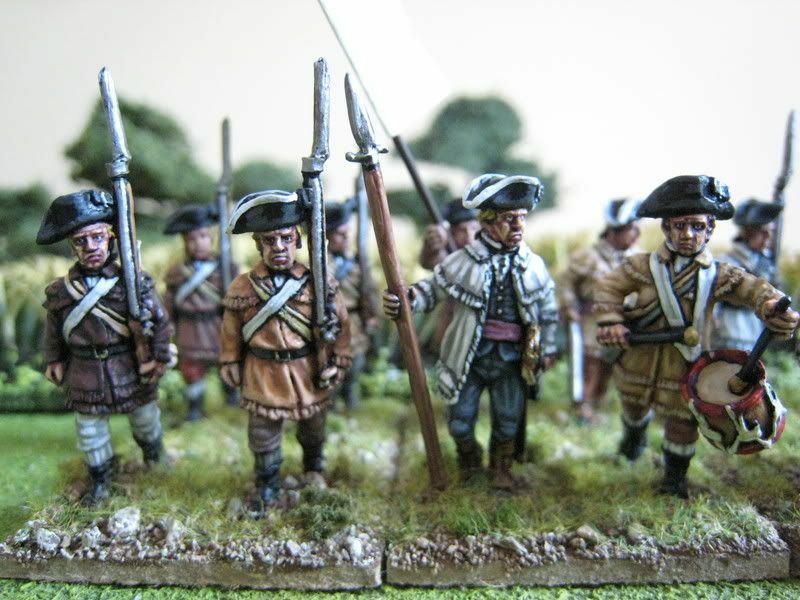 Then again, dyes would often not quite match, different companies within a regiment might have had their own distinct colours, and later units would have consisted of veterans who may have worn their older uniforms. In the end, I decided simply to mix the colours up for this regiment, but to apply a more structured approach in the future. 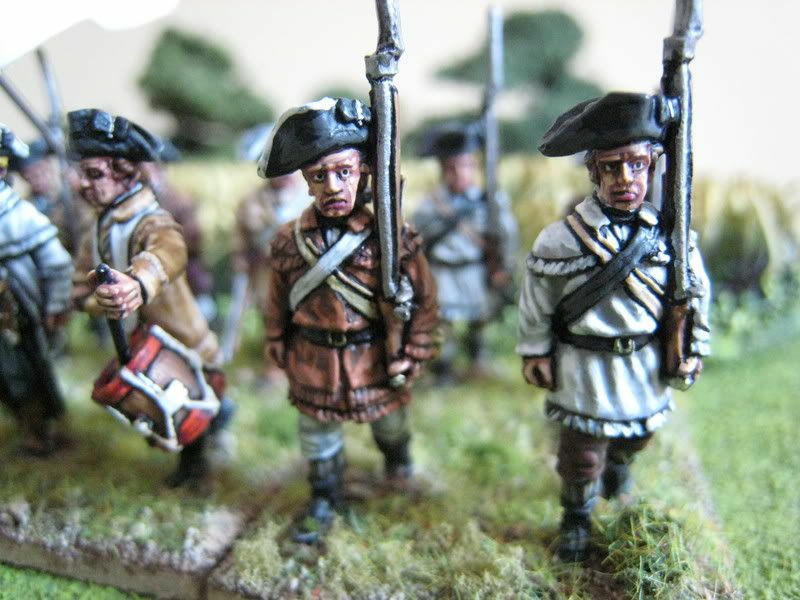 The units I am working on at the moment are primarily the three 12-figure North Carolina regiments that are required for the Eutaw Springs scenario from the second "British Grenadier!" scenario book. This is the 1st North Carolina. The second regiment will have buff/light brown hunting shirts, whilst the third will be a mix of hunting shirts and scruffy 1779 regulation coats for North Carolina regiments (this regiment will also be 16 figures, rather than 12, to make it more usable). So with the 1st and 2nd Regiments, I will effectively have a 20-figure hunting shirted regiment with an extra command stand. 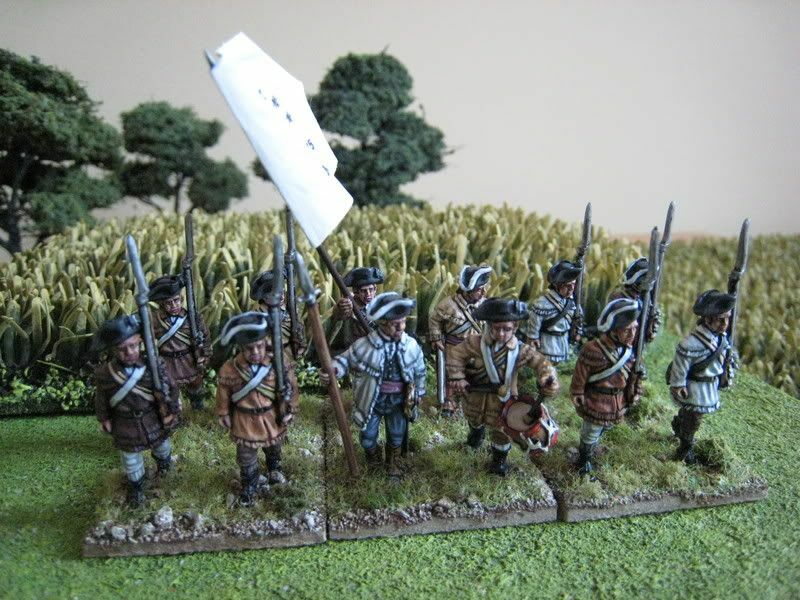 I also have another 20-figure militia regiment close to completion. 12 figures. Painted May 2008. Flag from GMB.